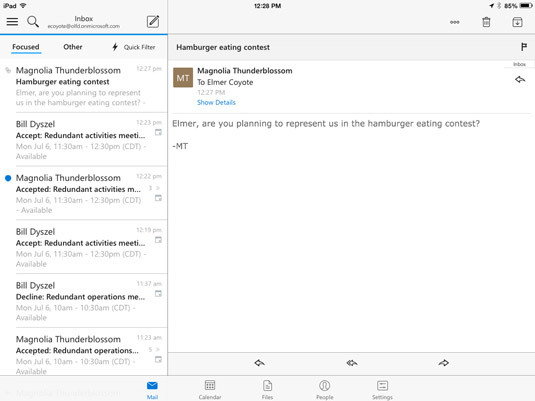 The first thing you’ll do with Outlook on your phone or tablet is to simply read email. The iPad screen shows you a layout of email messages that might remind you of desktop Outlook. It shows a list of messages on the left side and a reading pane on the right that displays the content of one message. To view a different message, touch the message you want to view in the list on the left and the contents of that message will appear. You can view an email message by touching it in the message list. If you’re using Outlook on an iPhone or Android phone, you’ll only see the message list. To see the body of a message, touch the message in the list and the message opens up. To go back to the message list, just swipe your finger from left to right across the body of the message to go back to the message list. Android devices also feature a back button at the bottom of the device that does the same thing. The mobile version of Outlook offers a very nice feature that desktop Outlook doesn’t have: something called a Focused view. At the top of the message list, you’ll see a few words: Focused, Other, and Quick Filter. The Focused view only shows messages that are addressed directly to you as well as messages that Outlook thinks matter most to you. If you tap the word Other, you’ll see a different set of messages that Outlook guesses are less important to you. It makes that guess based on the content of each message and what you’ve done with messages like that in the past. As time goes on, it learns what you find useful and gradually tries to make increasingly accurate guesses as to what’s useful to you. That’s especially valuable when you’re working on a tiny smartphone screen because you don’t want your view cluttered with random stuff you don’t need. There’s also a Quick Filter feature that hides messages you’re already read, or only shows messages you’ve flagged, or only shows messages with attachments. Again, those are three types of message that are likely to require your immediate attention, so Outlook gives you a way to focus on those.